Smart business owners and managers hire top-quality people to help them. You know this. You already hire people with the right skills and qualifications to do the jobs that you need to get done, but you don’t need to spend your time doing. You do that for sales, for marketing, for accounting, for managing individual stores, for product design, and a dozen other important tasks. And managing customer retention strategies is no different. You need the best assistant that you can find. But what kind of assistant would that be? Again, you already know the answer. For some tasks, an in-house employee is just the ticket. For other tasks, you bring in outside consultants and services who can provide specialized resources, expertise, and experience. When it comes to building customer loyalty , you will probably want to use the services of an experienced customer survey / customer relation management company such as Compechek, which can bring a variety of resources to the table, including expert survey designers, trained, experienced survey takers, and the ASK-LISTEN-RETAIN system for analyzing and reporting survey data and automatically managing resolution of customer complaints. Customized, detailed survey questions covering all aspects of your company’s products and services, based on your company’s specific interests, and designed with your input. Full, accurate transcription of customer comments. Complete, detailed records of individual customer responses. At-the-fingertips, password-controlled, graded levels of access to all reports and individual customer survey records for your company’s executives and managers. Full analysis of customer responses, based on positive, negative, and customized keywords, as well as answers to individual survey questions. Automated flagging and notification of potential problems and areas of interest. Complete reporting and analysis, with drill-down from top-level management to individual stores. District and regional breakdowns of survey responses, along with store-by-store and customer-by-customer records. Ratings of individual stores, districts, and regions based on key areas of interest. Automated management of customer problem resolution, with built-in enforcement of full store-manager-level accountability. 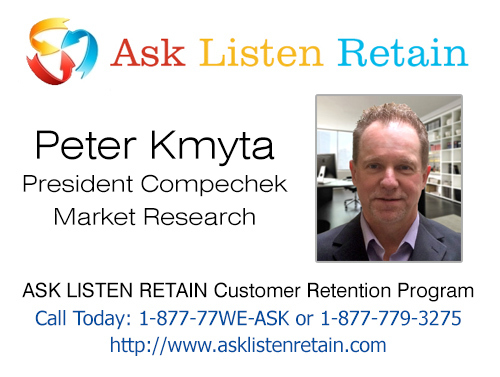 As you can see, customer survey services such as Compechek with the ASK LISTEN RETAIN program, brings a wide range of specialized skills and services to the table. Isn’t it about time that you brought in expert assistance for your customer survey needs?